During the summer season here in Cape Verde we are lucky enough to get turtles coming to the beach in the evening to lay their eggs. We also have nests hatching later on in the summer. 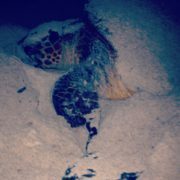 We run our turtle watching tours in July, August and September on a Tuesday and Friday at 7pm.